Tm Neary - Album #10. - NEWS! the 10th coldest with an average of 15.6 degrees. 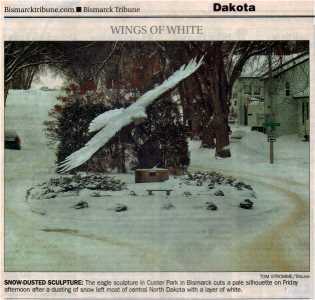 This National Newspaper used a photo of Tom's Eagle at Eagle Park in Bismarck. 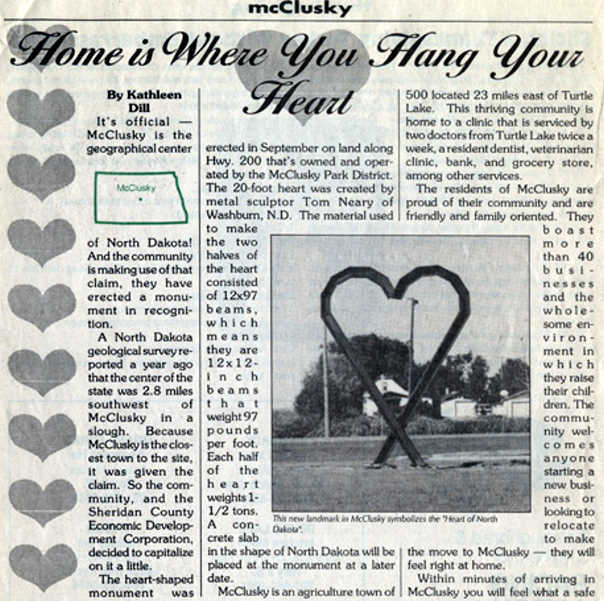 There's a big heart in McClusky that belongs to Tom Neary. 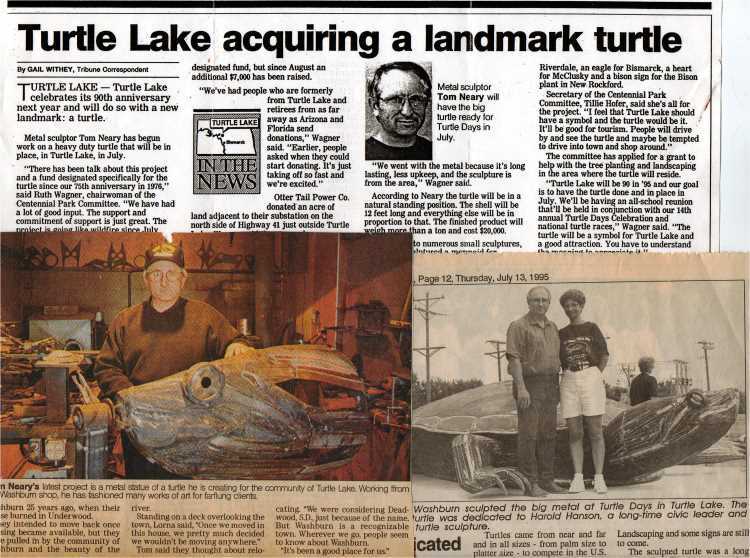 There's also an eagle in Bismarck, a turtle in Turtle Lake, some geese in Kenmare and a mermaid in Riverdale who all started out in Neary's Washburn workshop. 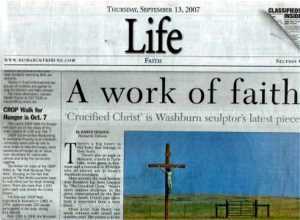 Most recently, the rural horizon near Braddock has been bisected by "The Crucified Christ," Neary's latest outdoor sculpture. 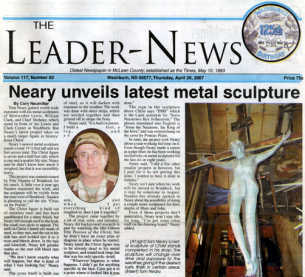 In the piece, commissioned by the Pete Naaden family, Christ's pale silver body is suspended from a rusty cross. 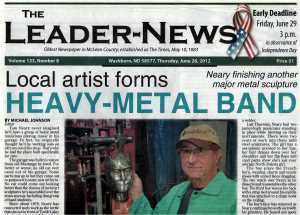 Metal artist Tom Neary can speak volumes with rusted and stainless steel. The artistry is in the choices he makes, the way he puts them together to direct the eye to the telling detail. The pieces also evolve over time, the weathering steel roughening, striating, aging, while the stainless remains serenely silver. 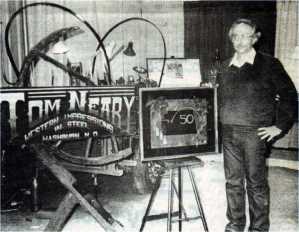 It's a technique Neary has used to great effect in many of his pieces. 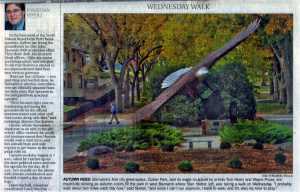 In Bismarck's Custer Park, Neary's bald eagle is rusted steel with a head and tail of stainless. The more it ages, the closer it resembles a bald eagle, Neary said. 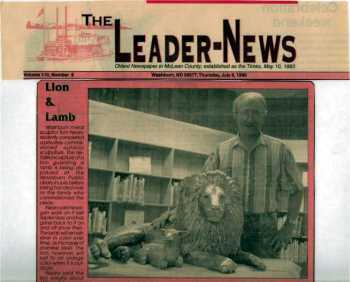 In Neary's "The Lion and the Lamb," the rusting lion over time grows burlier, more feral, making its protective embrace of the silver lamb more astounding. 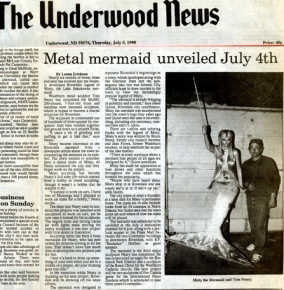 His mermaid glows silver, but only on her human half. 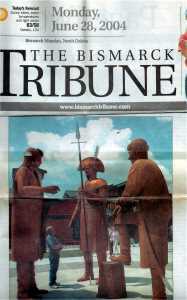 At the entrance to Washburn's Lewis and Clark Interpretive Center, a Paul Bunyonesque trio of oversized figures gaze stolidly at each other. 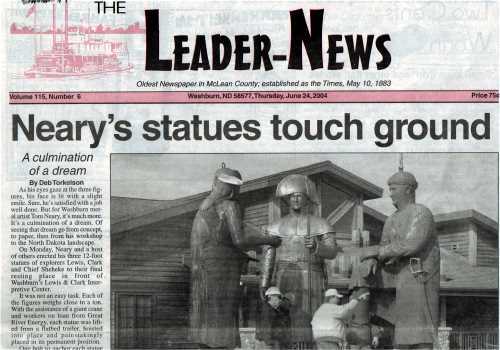 With their mute bulk wearing ever more rusty-brown into the landscape, the silver details - the jaunty cockade on Meriwether Lewis' hat, his sword hilt, William Clark's lance tip, Chief Sheheke's single feather and earring - telegraph the vital details about each man. The two metals speak in smaller pieces, too: In Neary's yard in Washburn, a simple trio of roses glow silver in their rusty, thorned stems near his backyard workshop, a weathered gray building holding a treasury of metal pieces from small fittings to large pipes. 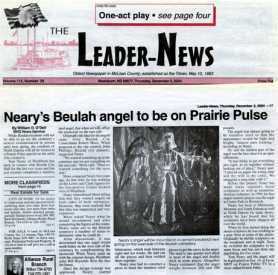 Neary always had a way of putting things together, "playing," he said, "seeing a different way of doing things." That "seeing" shows even in the mundane - the simple stool he built for craft shows is a small, beautiful piece of design, a weathered wooden seat atop graceful splayed metal legs. 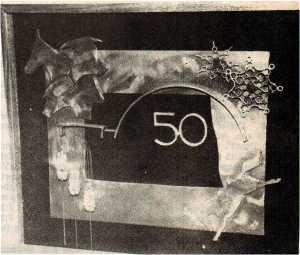 Flat metal pieces from a Bismarck salvage yard - shaped like small mantle clocks set on end - are nailed to the workshop's exterior wall. When paired with the curved centers together, out pops the iconic Western image of a buffalo skull. Reverse the pieces, and they form a perfect owl's head. In the Nearys' backyard, even a pair of hose guards of simple rebar each wear a bit of geometric detail like a jaunty hat. While Maggie the dog noses guests for additional affection, garden sculptures emerge like pleasant surprises from the lush flowerbeds that are the achievement of Neary's wife, Lorna. No wooden grandmas show their bloomers here - instead, there are brushed stainless abstracts and rusted wheat stalks, pelicans, a subtle brown needle-beaked bird nestled in a flowerpot. Life is a series of turning points, Neary said. 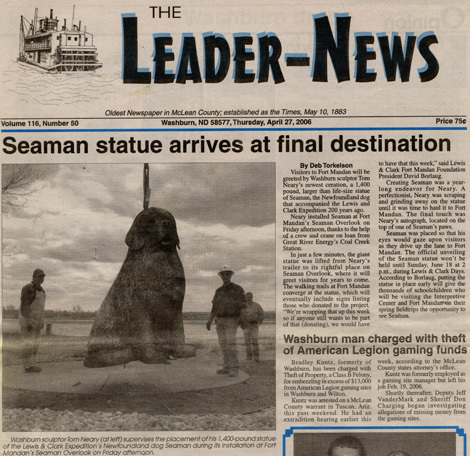 Twenty-five years ago, Neary was a pipefitter, working on many of the power plants going up in the region. 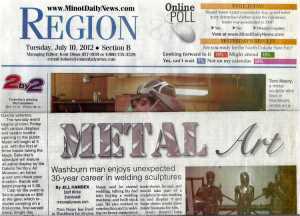 He had skills, he could weld and he had lots of tools. 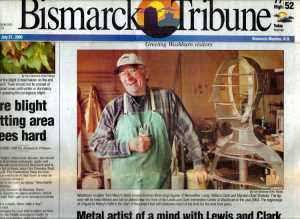 He created his first piece of metal - a cricket - because his wife wanted one for the hearth. Friends who saw them wanted some, too. While working a night shift with a plant startup crew, Neary saw some scrap metal and built a candle holder. That was about 1979. 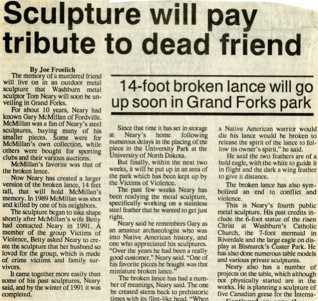 He then started taking a few pieces to art shows in Dickinson, Minot and Medora. His first two shows were successes; the next two, bad, he said. 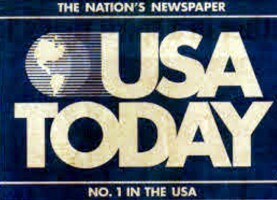 Had they happened in the opposite order, he may well have gotten discouraged and ended the whole thing there, he said. But as it happened, he made some sales and got requests for more of his work, and he followed through, though the road hasn't always been smooth. "My wife is such a good support," he said. 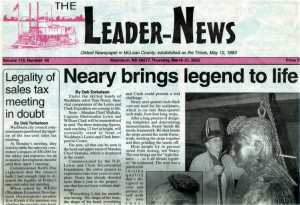 Neary made his first sale in 1982. 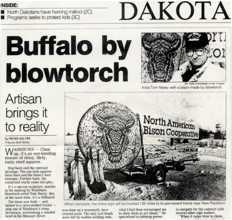 Eventually, he was invited to make an award piece for the U.S. Durum Growers. 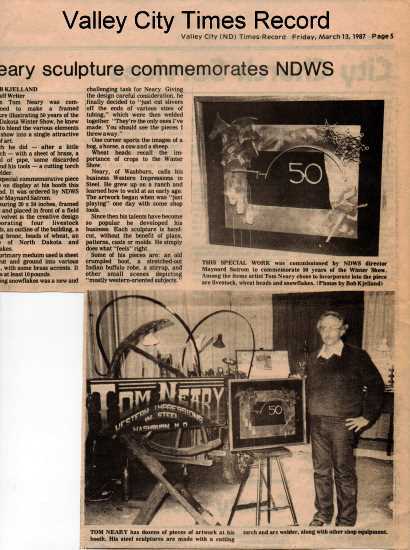 Neary set up his work at their convention and started taking his pieces to the Winter Show in Valley City. 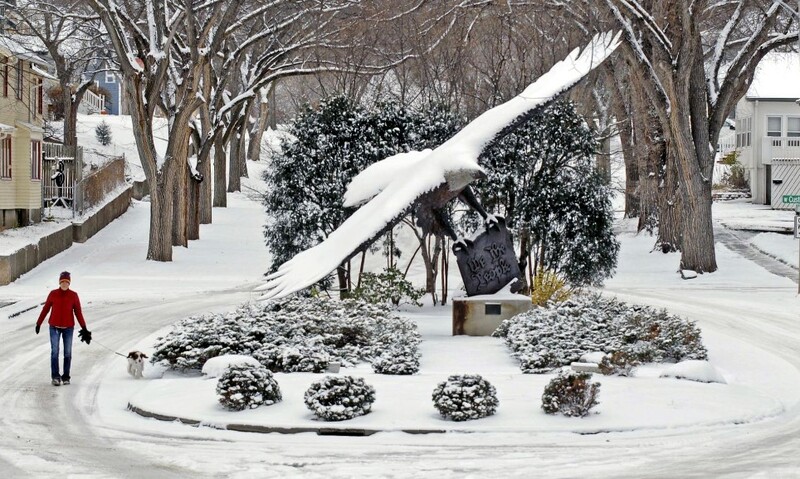 By 1988, he had created his first large-scale piece, the eagle in Custer Park. 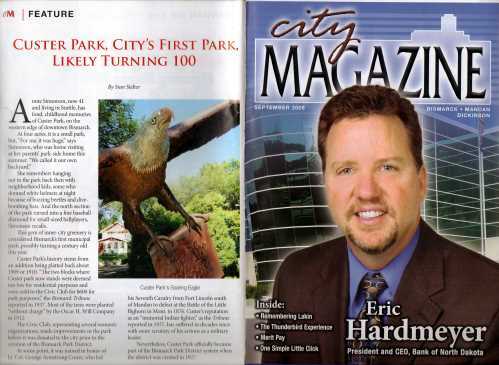 The eagle was designed for that specific spot, and Neary walked the angles countless times to get the right placement. "That was the toughest," he said. 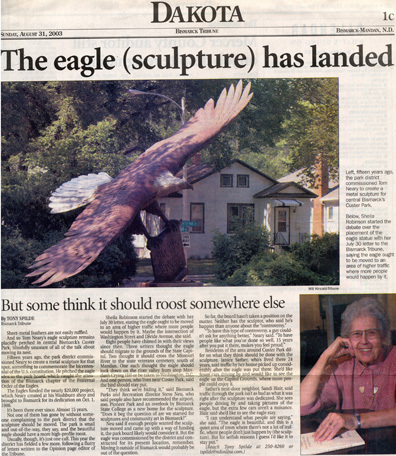 A small brouhaha erupted in 2003 over the Custer Park eagle, with some Bismarck residents campaigning to have it moved to a more visible location. 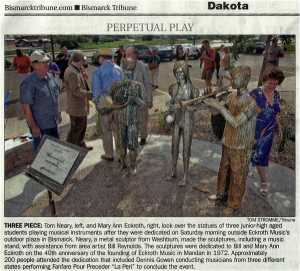 Though it eventually remained where it was, Neary said he felt flattered that the piece was so prized. 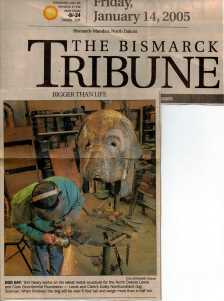 An artist who makes massive metal sculptures in the space of a large garage also must be a problem-solver. The geese now at Kenmare were assembled in the workshop, but the Custer Park eagle was taken out in pieces and assembled in place. The massive, 12-foot figures of Lewis, Clark and Sheheke were removed by cutting a square hole in his workshop roof, Santa's visit in reverse. Research and experimentation also come with the territory. "I'm real poor at drawing. I tried modeling. But I just dive in and start making mistakes," he said. "You learn to eat the mistakes and get it right." 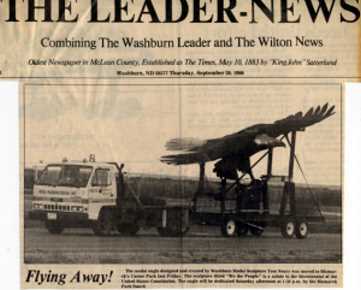 The three Washburn figures, which took four years to complete, took a tremendous amount of research to get the clothing as accurate as possible, he said. 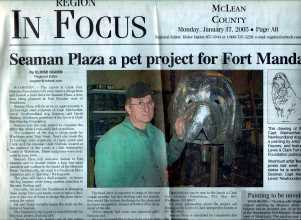 His project of Seaman the dog alone took a year. 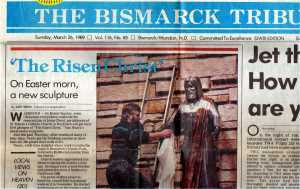 The Crucified Christ was a 14-month project. To help create the crucified figure, Neary looked for guidance in some unexpected places, starting with images from Mel Gibson's "The Passion of the Christ." To get his body proportions right, he sliced a Ken doll into segments and traced it onto paper, and researched cadaver images on a medical Web site. And even when the art's done, Neary's not done: Big art pieces require expert placement. "I deliver to the prepared site," he said. "I design the footings, supply the bolts and templates." With Lewis, Clark and Sheheke, for example, you have three people interacting, he said. "The placement with each other is important." So Neary made plywood templates of their feet, put in one bolt so the feet would pivot and moved them around until they were right. The hardest part, Neary said, is knowing what to charge for his work, since he can only estimate how long a project may take. And even when he's not working, he's still "working," figuring through the project in his mind. Neary hates to throw anything away, he said. 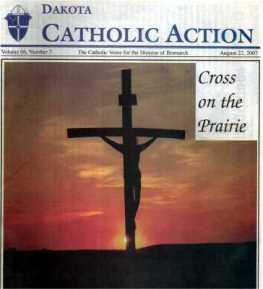 "The big piece on the (crucifix) crossbar was something I ruined on another project. 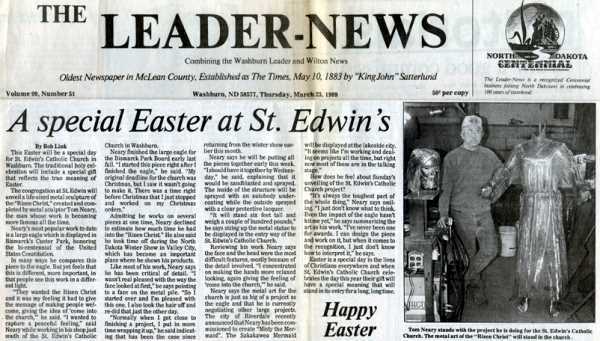 It was bent, laid back there for years," he said. Neary used to go to Porter Brothers in Bismarck, looking for salvage, he said. "They used to get Melroe scrap, and I'd get ideas for that. 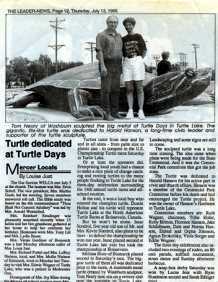 I'd walk through the scrap pile and my wife would wait in the car." She described for him the look she saw on his face during those strolls - "I was having a wonderful time. Treasures all over the place." After more than 25 years, Neary finds it hard to believe that this is his life. "It was something that just happened," he said. "I can't imagine how it has happened to me."